Viral is a story about Art and Zane, two boys who seek to attain internet ‘fame’ in order to become more popular at school and to make some money. It examines the role of social media and technology and how it impacts the way we record, communicate and think about events of racism, abuse and violence in our community. The show investigates the line between disassociation and raising awareness about such events. Inspired by true events, Viral uses physical theatre, multiple rolesharing, verbatim, political theatre, AV and an evocative musical score and to create a visceral and dynamic theatrical experience. Viral is an example of Shock Therapy Productions signature style of doing as much as possible with as little as possible. “Viral is a slick show, as you would expect in consideration of Shock Therapy’s previously acclaimed works”. 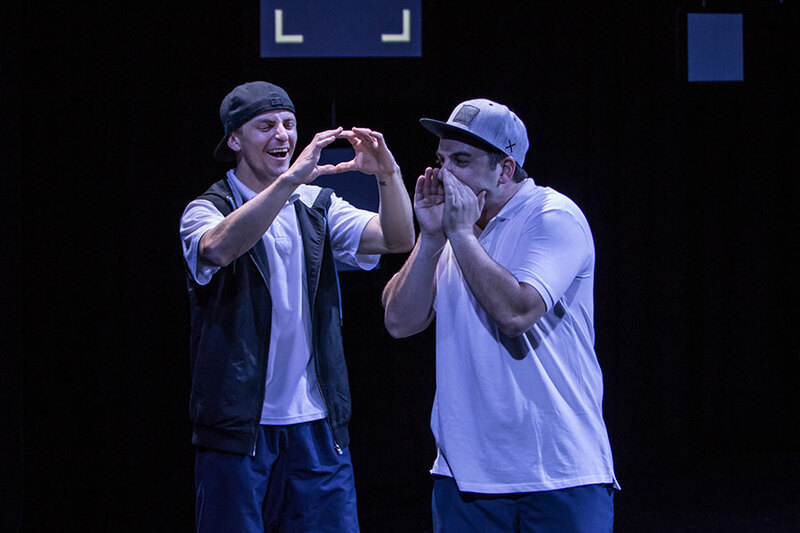 “the works hangs on the excellence of Foster and Jones, and the vitality of their performances together make for the show’s most appealing aspect”. “The stellar performances are led by writers and directors Sam Foster and Hayden Jones … this production company is young, energetic and very talented”. Secret Chef operate a pop-up diner at Lismore City Hall. This will be open from 6pm, Secret Chef will be showcasing a range of share plates, main meals and desserts using a range of secret recipes built up through their 20+ years in the hospitality business. All menus will have a vegetarian and gluten/dairy free option. The seasonal menu will be confirmed a week before the performance date. Our licensed bar will be open from 6pm, and also during and after the show. Drinks purchased from the bar are permitted inside the theatre. Sorry, no BYO. Duration is 70 minutes (no interval). Become a subscriber and save 20% on your tickets. Read more about subscription packages.